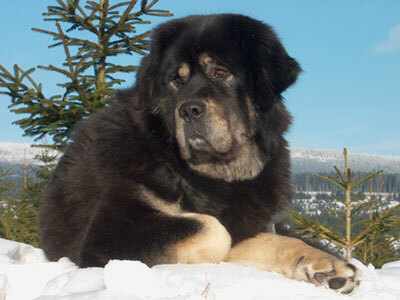 The Tibetan Mastiff is an ancient breed originating in Central Asia, often used as a guard dog. Its roots have been traced to 1100 BC, and they were thought to travel with Attila the Hun and Gengis Khan. This is an intelligent, independent, and strong breed. These dogs can be gigantic; males weigh up to 150 lbs. They are easy to train, but also intelligent enough to get bored quickly. Happy coexistence depends on keeping them occupied. The AKC points out that these dogs have extremely strong jaws and teeth, and that this, combined with a fondness for wood can lead to great destruction if the dogs get bored. They're known to be aloof to strangers, and devoted to their family. They require socialization from an early age so that they will accept visitors to the house. The Tibetan Mastiff is generally tolerant and patient with the children of the household, and they do well with other dogs. According to the AKC, some Tibetans believe that Tibetan Mastiffs have the souls of monks and nuns who weren't good enough to enter Shambhala (the heavenly realm) or be reincarnated as people. Also according to the AKC, Tibetan Mastiffs are traditionally kept with Lhasa Apsos, who would alert the larger dog to strangers. Read more about the Tibetan Mastiff on the AKC website, and check out this funny page with 10 cool qualities of the breed. These dogs are so huge! So big! I read this one funny article about them saying they're the closest thing to a bear one can legally own in all 50 states. LOL!